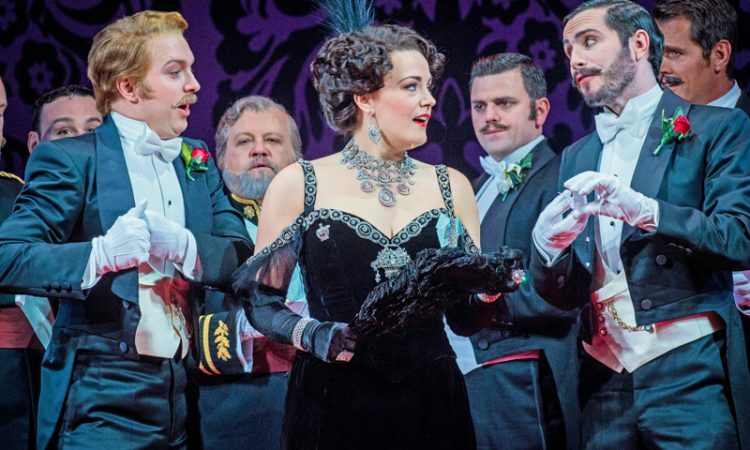 Franz Lehár’s THE MERRY WIDOW is obviously a period piece, the plot feather-light and predictable (*spoiler alert* the star-crossed lovers, cruelly separated in the first scene, are reunited in the final act), but none the worse for that. If TOSCA is a rich, full-bodied red wine, The Merry Widow is a bottle of champagne, ready to pop. The music dances delightfully (and not just in the titular Waltz) and the tunes are memorable. 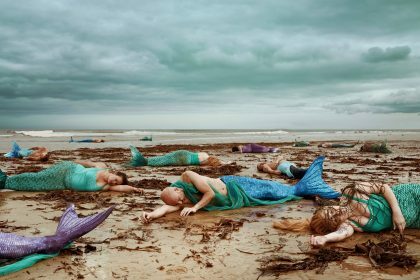 This production radically rewrites Viktor Léon and Leo Stein’s original libretto to add some contemporary jokes and innuendo, but more importantly draw out some of the characters in a more subtle and sympathetic way than some earlier productions have done. The set is pure turn-of-the-century Paris, all Art Nouveau, saucy statuary and chandeliers as our protagonists pay tribute to their Balkan ‘Fatherland’, Pontevedro, whilst enjoying the luxuries and seductions of Paris. The principals, in traditional Pontevedrian costume, mingle with the girls from Maxim’s (Lolo! Dodo! Joujou! Froufrou! Cloclo! Margot!) and the suave French society gentlemen. 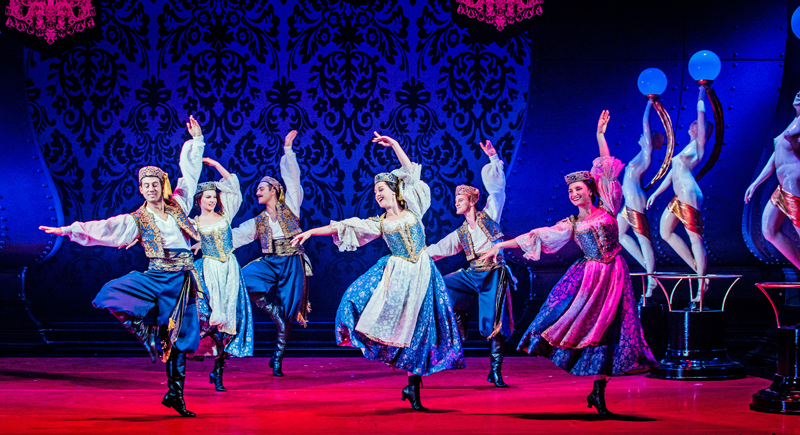 The music gives us everything from can-cans and waltzes, to eastern European folk tunes and dances. The romantic triangle of Baron Zeta, his wife, Valencienne, and Parisian gigolo Rosillon, is wittily and touchingly played. We initially see Zeta as a besotted old fool who can’t acknowledge what everyone else sees, that his wife is amorously entangled with Rosillon. Gradually, however, we get the sense that these characters cannot be reduced to mere stereotypes (the cuckolded husband, the faithless wife, the gigolo). Geoffrey Dolton’s comic, but sympathetic portrayal of the Baron reveals a man who knows perfectly well that his wife may be straying, but refuses to acknowledge it; not because he’s smug or stupid, but because he’s desperate not to lose her. 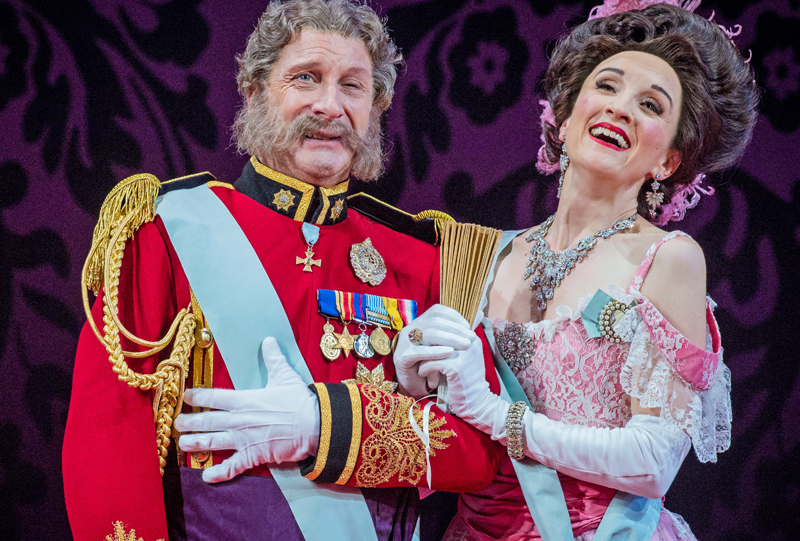 As the Baroness (and former Maxim’s girl), Amy Freston demonstrates her prowess as a dancer (spectacular splits and high kicks) and reminds us of the comic timing she showed off to great effect in last year’s Trial by Jury. Here she suggests that she is genuinely torn between her affection for her husband and the lure of a former (and much younger) lover. 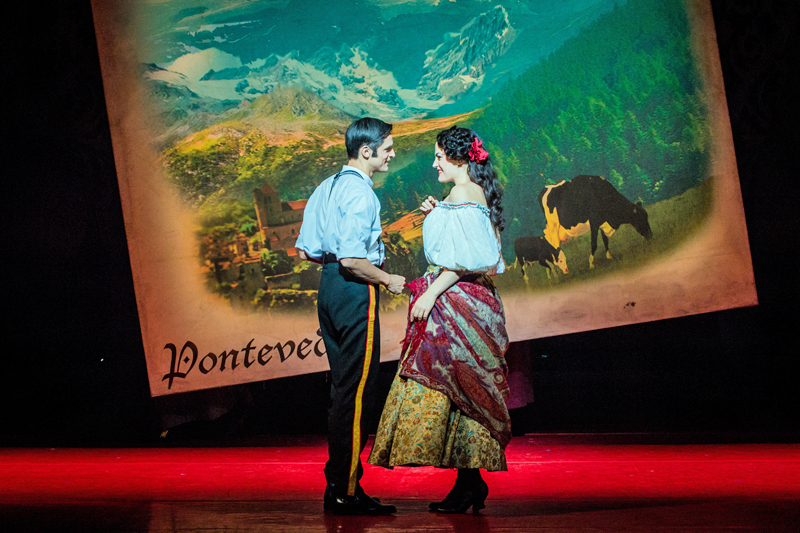 And Nicholas Watts as Camille de Rosillon leaves us uncertain – Does he love Valencienne? His reluctance to take the easy option of marrying to acquire a fortune and a respectable front behind which to conduct an illicit liaison, suggests that perhaps he really does. We know, of course, from the outset that a happy ending is as inevitable as a tragic one is in a Puccini opera. But if that happy ending is to be enjoyed, it needs to feel earned. We need to believe that Hanna and Danilo not only loved each other then, but love each other now; we need to accept their reasons for not simply falling into each others’ arms and bringing the whole thing to a much earlier conclusion. Quirijn de Lang is a delight in the role of Danilo. In the summer he was a splendid Fred/Petruchio in Kiss Me Kate, and before that played husband Sam in Leonard Bernstein’s Trouble in Tahiti. As before, in The Merry Widow he can be macho swagger or louche decadence one moment, and compassionate the next. He’s a glorious singer and dancer, and a fine actor. He is beautifully matched by Maire Flavin’s Hanna, who uses her own Dublin accent to convey that she’s not really at home amongst the patrician society to which her wealth gives her access. She has a great line in sharp put-downs of the men who cluster around her, drawn by her charm, beauty and wit (or is it just that fortune?). Her voice is rich and expressive, both in the lighter, more cynical numbers, and in the heartfelt poignancy of ‘Vilje, oh Vilje’, the folk tune she sings at her Pontevedrian soirée in Paris. Opera North set this piece within their ‘Before War and After’ theme, to mark the centenary of the Armistice (their next production will be Silent Night, a UK premiere inspired by the 1914 Christmas truce). Yet whilst the mention of the Archduke and of Sarajevo might add a frisson of foreshadowing for a modern audience, there is no real shadow of war hanging over this piece. Hearts may be broken, but they can be mended; true love wins the day, and even if the war between the sexes is ongoing, it’s a war that both sides seem to rather enjoy. 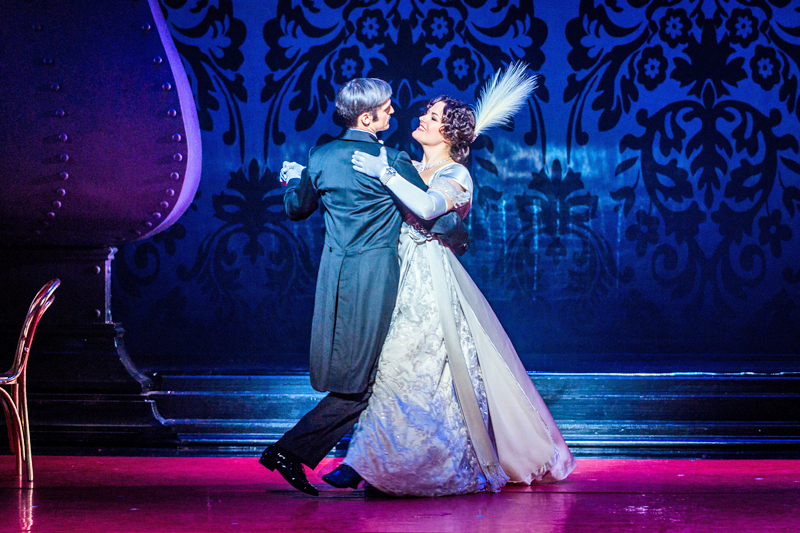 Opera North’s The Merry Widow is at Leeds Grand Theatre until 12 October. More details here. On tour: Newcastle Theatre Royal (24 and 26 October), Hull New Theatre (2 November), Nottingham Theatre Royal (8 and 10 November) and the Lowry at Salford Quays (15 and 17 November). Previous Post:MUSIC | Tom Robinson … He Still Ain’t Gonna Take It!